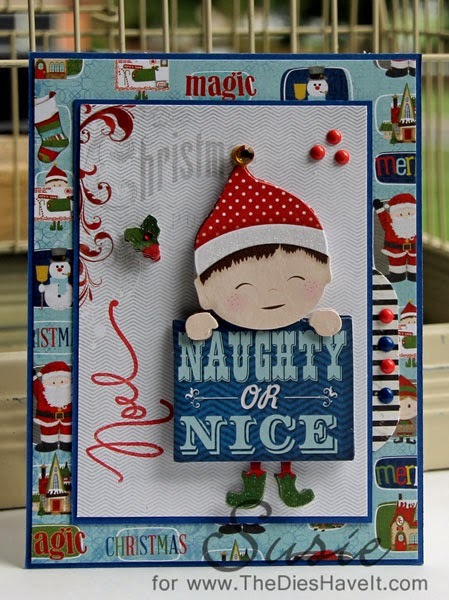 Created 4 Creativity : Naughty or Nice? I hope you are having a great weekend so far. I've been watching scrapbook videos and learning so much at True Scrap Five. If you ever get the chance to join a True Scrap event, I know you will be pleased. My card today is made from Bo Bunny Elf Magic products. I am doing a mini book using this collection, but took a break to put together this card. 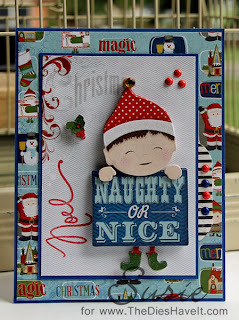 The little elf is a premade embellishment which made the card super quick and easy. It seemed it needed just a bit more on the left side, so I found this stamp from PaperTrey Ink and once I stamped it, I knew I had found the final piece of the puzzle. Are you working on your Christmas cards yet? It's not too soon to think about it! !